A hit-and-run driver who struck and killed a 24-year-old woman on a pelican crossing in Manchester has been jailed. Emma Galton died after being hit by a car driven by Laurence Crossan, 28, on Chester Road, Hulme on 28 June. Crossan was jailed for seven years and four months at Manchester Crown Court. Miss Galton's father said the family had been left with a "big hole that will never go away" and said the fact that Crossan hit her without stopping showed "great cowardice". Mr Galton said his family had been changed irrevocably because of Crossan's "selfish and reckless actions". "The fact that upon hitting Emma you carried on without slowing down, let alone stopping, would indicate great cowardice and concern only for your own welfare," he said. The court heard that Crossan's silver Ford Mondeo mounted two pavements and crossed a grassed area and a cycle lane to emerge from a side street onto Chester Road. CCTV footage showed the car not slowing down before hitting Miss Galton at an estimated speed of between 34 and 42mph in a 30mph zone. Crossan then drove off, overtaking other vehicles and driving through another red light, the court was told. 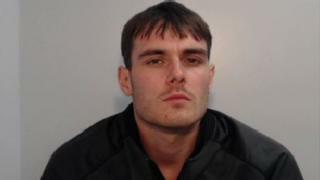 He abandoned the car near his girlfriend's house in Reddish, Stockport and handed himself in three days later, but gave no comment to police. He pleaded guilty to causing death by dangerous driving and a separate count of dangerous driving. Judge David Stockdale QC, the Recorder of Manchester, said that while Crossan had shown genuine remorse he had not given a satisfactory explanation for his "bizarre" driving. The defendant has a previous conviction for possessing heroin and cocaine with intent to supply, the court heard. The judge said: "This court is not naive. There must be a suspicion, which is reinforced by your criminal record, that you were intoxicated either through drugs or consumption of drink - but I must emphasise that is only a suspicion and no more. "Your driving was simply appalling, It caused the utterly needless death of a talented young woman."